Is Condensation Caused by the Windows? When Does Condensation Most Often Occur? When is Condensation a Sign of Something More Serious? Throughout the year, window condensation – or window sweating – is a natural occurrence on the windows of your home or office, and it can happen frequently on new replacement windows. When we see condensation, our first thought is that there’s something wrong. In most cases, though, condensation is not a sign of a faulty window. It may be a sign of an energy efficient window. New windows, for example, are more likely to collect a small amount of condensation because they conserve energy more efficiently and are better insulated. Therefore, during cold weather, interior glass temperatures are higher than the outdoor air. When cool outdoor air reaches this warmer interior glass, the temperature differential is more significant, and condensation is more likely to form. In the summer, the opposite happens. The better insulation keeps cold temperatures inside, and the interior glass tends to be colder. This way, when it meets the warm outdoor air, condensation is more likely to form on the exterior of the window. Bottom line, window condensation can be a pesky problem, and in most cases, it’s not a cause for alarm. There are some instances in which the indoor humidity or issues with the window may be causing the condensation. We’ve highlighted a few common causes of window condensation and things you can do to fix here. Is Condensation Caused by the Window? The short answer is no. 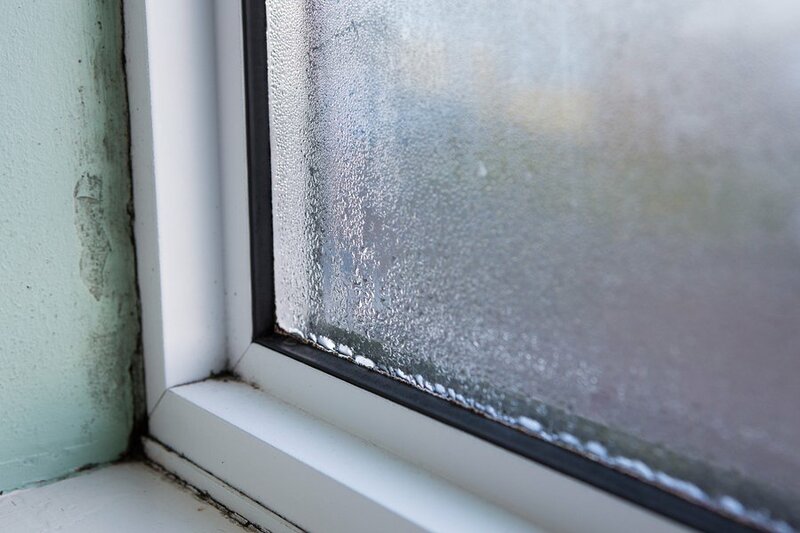 Condensation shouldn’t alarm you; your windows are not faulty. A small amount of condensation during the coldest and hottest months may be a good sign. It means that your windows are effectively holding warm air (in winter) or fresh air (in summer) inside. Today’s replacement windows are extremely energy efficient. They’re designed to conserve the energy inside your property, and thus, the temperature difference from outside to inside is greater. That’s why if you’ve recently replaced your windows, you might notice some condensation. In other words, during winter, you might have never noticed condensation, because your old windows weren’t correctly keeping the warm air inside. They were drafty, and the warm, moist interior air was escaping out the window, causing the air around the window to be a consistent temperature and the moisture from inside to escape, rather than collecting on the window. Condensation commonly occurs in northern U.S. climates, in the Mid-West and further south during cold snaps and heat waves. It is most likely to form when the difference between interior and exterior temperatures is extreme, i.e., during a Polar Vortex or the hottest, most humid summer days. In the winter, condensation usually forms on the interior of the window pane. And during summer months, it develops on the exterior of the window, similar to morning dew. In summer, though, condensation often burns off as the day progresses. When the humidity inside your property is high, there is more moisture in the air, and condensation occurs more frequently. That’s why condensation commonly collects on windows after a shower, when doing the dishes, or when running a humidifier. This happens because there’s a lot more moisture in the air, and it isn’t able to escape at the window. As a result, condensation forms on the glass. At the beginning of the heating season, condensation is also very common, because the heating system brings more moisture into the air. As the season progresses, this moisture is absorbed by the building, reducing the occurrence of condensation. Excessive condensation can be annoying and, in some cases, a sign of something more serious. First, it may be an indication that it is excessive, “problem” moisture in the air. If you notice water spots on the ceiling or walls, your heating or cooling system may be putting too much moisture in the air, or you may have water leaking somewhere in the property. The result is a higher humidity level, which causes condensation to form more frequently. To remedy this, you need to find the cause of the humidity at the source. Very rarely is condensation a sign of a faulty window, but if water is collecting between two panes of glass, the seal may be damaged. In these cases, the window may need to be replaced or the seal refitted. So, what can you do? Ultimately, the best solution depends on the severity of the problem and its cause. If you’re experiencing condensation because of high indoor humidity levels, controlling moisture is the fastest and surest fix. If the condensation is caused by poorly insulated windows, on the other hand, improving weather-sealing or replacing the window may be the best solution. • Controlling Interior Humidity: If there is too much moisture in the air, condensation is more likely to form on windows. The remedy may be something as simple as moving plants and fish tanks away from windows. The source of the humidity may be something more serious, like a faulty cooling system. We recommend first identifying the source of the moisture. Updating a newer HVAC system, using a dehumidifier, or upgrading a ventilation system can all help to reduce moisture and window condensation. • Increasing Ventilation: Better air circulation improves the airflow along the window, which may help reduce the occurrence of condensation. For instance, in the home, running an exhaust fan when using the shower is a conventional method for circulating warm, wet air. Additionally, ceiling fans, opening windows, and or installing a heat recovery ventilator can also increase airflow and reduce condensation. Sometimes, all you need is just a bit more air movement to keep the temperatures constant and reduce moisture in the air. • Opening Drapes/Blinds: Heavy drapes minimize the flow of air at the window, which can contribute to condensation. By opening drapes and window treatments, the air moves more freely along the window, effectively reducing condensation. Will New Windows Reduce Condensation? If your property has inefficient, single-pane windows, condensation can be a constant battle during winter and the high heat of summer. The reason: The windows are poorly insulated. Therefore, the temperature of the glass from outside to inside tends to be extreme, and condensation is created as a result. Double or Triple Glazing – Updating single-pane windows with double- or triple-paned windows can quickly minimize condensation. The spacing between the exterior-facing and interior-facing glass dramatically reduces the temperature differential. This way, condensation is less likely to form. Gas Fills – Many of today’s double-paned windows have gas fills between the layers of glazing. This helps to slow heat transfer, and in winter, the warm interior glass doesn’t come into direct contact with the cold outdoor air. Coatings and Films – Energy efficient window coatings add a layer of insulation to the glass, creating a barrier between the glazing and the humid indoor air. This can prevent interior moisture from collecting on the glass. Efficient Spacers – In double- or triple-paned windows, spacers sit in between each pane of glass. Today’s spacers are more efficient than ever, and utilize materials like metal alloy or foam to reduce heat transfer and seal out moisture. Foam tends to be one of the most efficient options for creating a warm edge around the window. Weather Stripping – Poor insulation around the edges of the window allows air to escape, and as a result, the temperature of the glass drops, e.g., warmer in winter and colder in summer. As a result, this flow of air can be a significant source of condensation. New windows are designed with built-in sealants and weather-stripping to create an air- and moisture-tight seal. In short, window condensation or sweating shouldn’t be a cause for alarm, especially if you’ve recently installed new windows. This is often a sign that the interior glass is warmer because the new windows are better insulated if you notice that condensation stays on the window for more extended periods that may be a sign that you have larger moisture issues. Interested in how new windows can help reduce condensation? Contact Aeroseal today for more information about our energy efficient replacement windows. Our commercial windows are designed and built with the latest features to minimize condensation. If you have any concerns about your window or suspect they may be faulty, be sure to give us a call at 1-888-380-2376.